Tired of waking up tired? Is your snoring keep others up? Sounds like it’s time to invest in an easy to use and more comfortable sleep apnea solution! Introducing the revolutionary DreamStation by Philips Respironics! This incredible machine empowers you to take control of your health with progress tracking, goal-setting tools, and helpful videos, tips, and ongoing feedback. 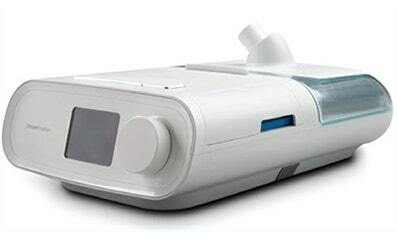 The DreamStation Auto CPAP machine, unlike it’s competition, has been approved by the American Academy of Sleep Medicine. Built-in Smart Technology allows for fluctuations in pressure settings; meaning as you fall asleep and wake-up your DreamStation will auto adjust to your needs. The DreamStation is known for its connectivity and DreamMapper technology. With DreamMapper, you can set goals, receive ongoing feedback, and watch helpful videos to keep you motivated! The DreamStation Cellular Modem is an interactive and removable feature that works to transfer your sleep data between the device and DreamMapper software. Download the DreamMapper application on your cellular device for an in-depth look at your progress. Revolutionary adaptive technology allows the DreamStation to continuously adjust to the humidity levels in your immediate surroundings. Ready to learn more? Call 1-877-667-9130 or fill out the form below for more information!